What do you see in Rembrandt’s sketch of the prodigal son? What I see is a father – a father who is falling to his own knees under the heavy weight of his son. Becoming a parent is one of the life experiences that can teach you about the deep love of God. As a parent, you feel such deep love for your child, and as their life goes on you keep on loving – it’s not possible to stop. But you don’t have to be a physical parent to feel this kind of this love. Perhaps you’ve adopted a child, helped raise a niece or nephew or a grandchild…. Perhaps you’ve grown very close to the child of a friend… Or maybe you feel the beginnings of this kind of spontaneous love, right now, as you see one of these little ones here at St. Benedict’s. Most of us, in our different vocations, have experienced this kind of love. We’ve been teachers or mentors for younger people; we became attached to them, we even came to love them at a deep level – and we still love them years later, even when they have disappeared into their own lives. Life gives every one of us opportunities to love: To watch someone grow up – physically or professionally; to protect them when they’re in danger – real or imagined; to cheer them on when they’re successful, comfort them when they are crushed; to pray for them when they’re hurting, counsel them when they need help – and to step aside when they go their own way. Rembrandt has to have understood this love – among other tragedies in his own life, four of his five children died as infants. In this painting, the weight of the father’s love for his son is heavy, almost too heavy to bear. We also have a son who went away. Like the son in Jesus’ parable, our son Andrew has plunged, over and over again, into the depths of homelessness and despair. At 18, Andrew left home to begin his new life in California. First he lived in his car, then moved in with his grandparents, then helped take care of his dying grandfather… After his grandfather died, he had his first psychotic break, but when his grandmother insisted he go for psychiatric help, he went back onto the streets instead. At 23, he joined the Navy, ending up in the Persian Gulf during the first Iraq War. The night before the war started, he called us. At the urging of the commanding officer, all the men on the ship called their parents, or their wives or sweethearts for a last conversation… But although all on his ship survived, we didn’t hear from Andrew again for three years. At 27, he did come home again, bruised from life on the streets and clearly mentally ill. While in the Navy, he had other psychotic breaks – and a few months before he came home, the Navy had given him a medical discharge. Like so many veterans with mental illness, Andrew was back on the streets again. In the 20 years that have passed since then, Andrew has never had a home. He has gone from his own apartments to living on the streets, he has gone on and off medication, back and forth to hospitals and VA group homes… He still dreams of living independently, of being in charge of his own life – and the last time we talked with him he told us that he doesn’t want to talk to his family – not until he’s back in charge of his own life..
And so we have to love him from a great distance. As parents, we not only feel love, but we know we’re called to keep on loving even when it hurts. As a family – parents, a brother, a sister – we know our family was not only created in love, we are called to keep on loving. As a faith community, created by Christ’s love, we are called to be a people who keep on loving. Rembrandt painted The Return of the Prodigal Son in the middle of the 17th century. Three centuries later another Dutchman, Henri Nouwen, wrote a book with the same title – a meditation both on Jesus’ parable and on Rembrandt’s painting. * Nouwen was a Catholic priest who influenced Christians from many denominations; Rembrandt probably leaned towards Protestantism, although he never joined a church. But Rembrandt’s painting and Nouwen’s writing, created more than 300 years apart, both show us how Jesus’ parable illustrates God’s love. From Rembrandt’s painting, Nouwen learned about the deep joy and unbearable pain of loving – and through Rembrandt’s brush Nouwen heard the call to keep loving when it’s hard, just as God continues to love us. As children of God, can we keep showing each other how much God loves us? 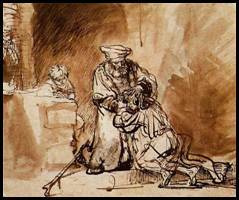 We can learn from each other, as Nouwen learned from Rembrandt; and we can support each other, as we all struggle with the pain of loving. Because – above all, because – because we are loved, we are called to be people who keep on loving. A Meditation on Fathers, Brothers, and Sons. Doubleday, 1992. This sermon was preached at St. Benedict’s Episcopal Church, in March, 2013. To protect our son’s privacy, it was not posted at the time. Robert Andrew Ross died in his sleep on February 18, 2014.
the Andy who loved everything and everybody. Throughout his adult life, Andy struggled to believe in a loving God. Like many people with severe mental illness, he felt God judged him very harshly. that he has always been held in the arms of his heavenly Father. There was a man who had two sons. The younger of them said to his father, “Father, give me the share of the property that will belong to me.” So he divided his property between them. So he set off and went to his father. But while he was still far off, his father saw him and was filled with compassion; he ran and put his arms around him and kissed him. Then the son said to him, “Father, I have sinned against heaven and before you; I am no longer worthy to be called your son.” But the father said to his slaves, “Quickly, bring out a robe – the best one –and put it on him; put a ring on his finger and sandals on his feet. And get the fatted calf and kill it, and let us eat and celebrate; for this son of mine was dead and is alive again; he was lost and is found!” And they began to celebrate. Now his elder son was in the field; and when he came and approached the house, he heard music and dancing. He called one of the slaves and asked what was going on. He replied, “Your brother has come, and your father has killed the fatted calf, because he has got him back safe and sound.” Then he became angry and refused to go in.